A huge boost for the education/sports project came last Saturday in the Jamestown suburb of Accra. 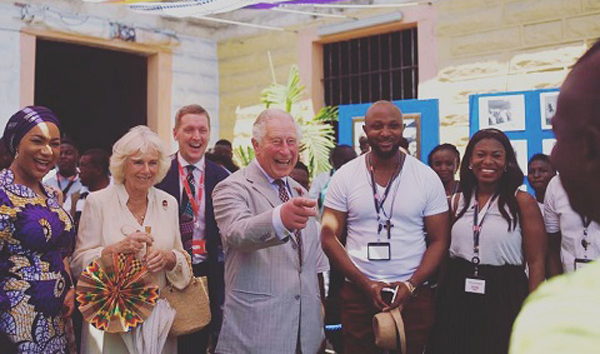 On his tour of Ghana, HRH “The Prince of Wales” spent time with the coordinators, volunteers and pupils of the communities’ impact project. The 30 minutes interaction offered the Prince and HRH the Duchess of Cornwall, an insight into what Books & Boots really does and how it supports boys and girls with talent on the pitch and excellence in the classroom. In September 2018, the Communities Champions League was launched in the sprawling community of Ashaiman and has since toured Tema, Spintex and Kaneshie in Accra. The project targets less privileged children in some deprived communities in order to identify academic potential in class, especially through reading as well as unearthing their talent on the pitch that can be guided and moulded into excellence. Historically, Books and Boots was first established in 2008 as Street Soccer Africa at Mantse Agbona in Jamestown. Eight teams played a community gala for children between 15 years and below.